Python is one of the popular programming languages because of its elegant syntax, dynamic typing and interpreted nature. If you have not gone through the “Getting Started with Python”, I suggest you read it to get the most of this tutorial. You can use print() function to display the data to the screen. After starting the IDLE you can enter the print()function to see how it works. Try the following code in the shell and check your output is correct as give below. Here we used three escape characters that are embedded inside the text. Escape characters interprets differently when place inside the text. It acts as a line feed and move the text one line down. It is very useful if you do not want to repeat the print and display text on several lines. It is tab function and separate each words with fixed tab gap. Use this to display the text in double quotes as an output. TimeOut London published list of London's best cafés and coffee shops. Some of them included are: The Attendant, Curators Coffee Studio, Department of Coffee & Social Affairs, FreeState Coffee, Look Mum No Hands, Rapha CC, Workshop Coffee Co and Timberyard Seven Dials. 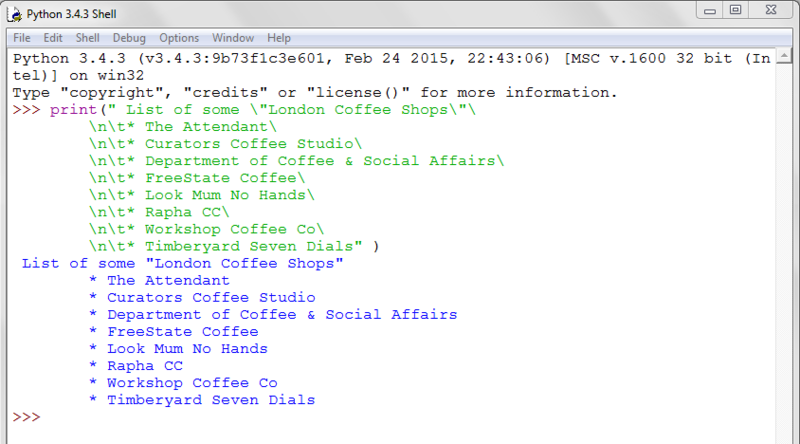 List of some "London Coffee Shops"
Now see the following sample solution. Go through it and make sure you understand the code and the execution output. Write a code that displays the names of these books in following layout with heading: Great Books turned in to Great Films. Now see the following sample solution. Go through it and make sure you understand the code and the program execution output. Note down how to combine the text with the escape character \n and \t. The print() function will process the ext and prints it in clean format as show in the code below. If you use line feed escape character twice \n\n the text will move two lines down when displayed. Similarly using tab twice or more times \t\t will result in equally increment of space. In programming we categorise data into their specific types. You can use type() built-in function to get the data type of data. You need to place the data inside the parentheses of type(). Python has following data types that it uses to identify and categorise data. Go the the Python IDLE shell mode and enter the following code. type(“London”) data type is str (String) means text. type(34) data type int (Integer) means whole number. type(7.8) data type is float means decimal number. type(True) data type is bool (Boolean) means boolean values. type() data type is list means collection. List and Dictionary are collections. They act as containers to hold groups of data, more on this later. This shows that Python determines the type of data from the data itself and records it internally and remembers it. It is short form of length. 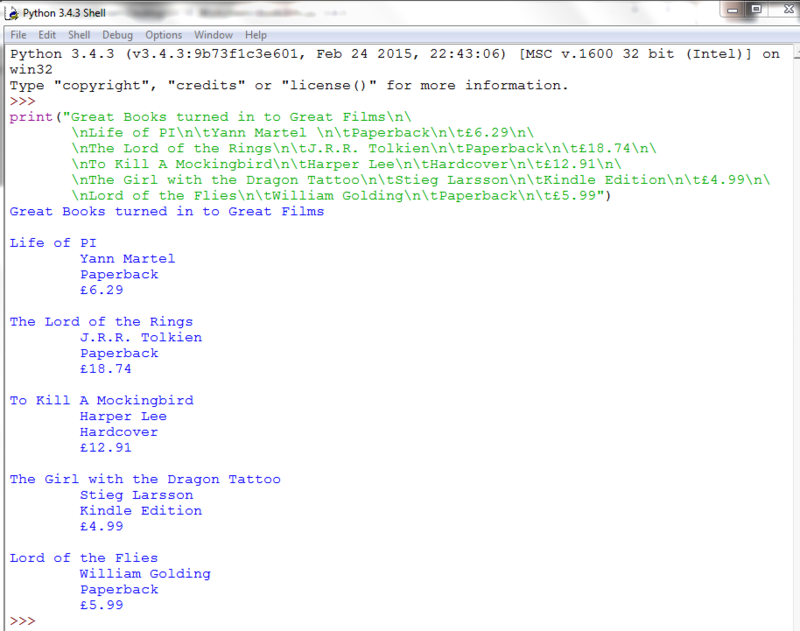 It can be used to get the size of string/text in Python. You can place the string in the parentheses of the function and it will calculate the size of text by counting each character including the blank spaces. We can use it in many other ways and provide other data beside strings, we will cover it later. See below the execution of this function in the Python shell. By now you must be comfortable and indentifying some of the built-in functions in Python and how to use them in an interactive mode by using the Python IDLE shell mode.